108mm bolt mounting pitch, suitable for most Japanese bikes. 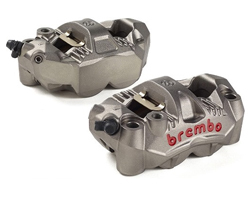 The new GP4-RS monoblock caliper was inspired by the one-piece units developed by Brembo for MotoGP, and produced using a very complex foundry technique exclusive to Brembo, has resulted in a 10% lighter unit than the renowned M4. 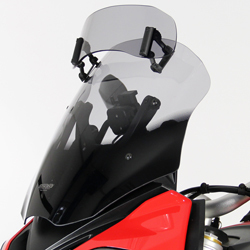 The MotoGP derived fins around the piston bores provide 30% more cooling area for more efficient heat dissipation when braking to reduce thermal stress to the brake fluid and the structural ribbing on the front section of the body increases stiffness - protecting the caliper from deformation - keeping pistons/pads perpendicular to the discs for more consistent feel and power. 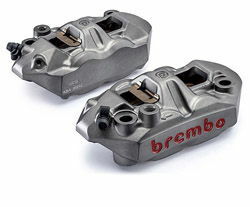 Brembo road and track-day sintered pads are included, but for those who want maximum performance, the calipers are compatible with GPFAX 447 or Brembo Racing Z04 brake pads ...these are full blown "Factory Pads" used in the Superbike and SuperSport World Championships... and their 'pinless pad design enables quicker and easier pad changes. 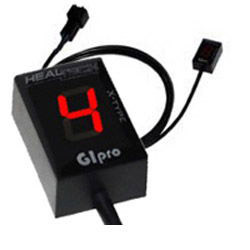 The same adhesive temperature sensing strips as used in MotoGP are also included - by placing these on your calipers you can measure the temperature reached and witness the improved cooling first hand. As the these are often a direct replacement for your bike's original radial calipers, no spacers or bolts are included. We can supply these if required and please contact us if you need to discuss. !braking, brakes, claipers, yamaha, r1, yzfr1, yzf-r1, r1m, yzf-r1m. yzf-r1m, r6, yzfr6, yzf-r6, honda, cbr1000rr, fireblade, zx10r. zx-10r, gsxr600, gsx-r600, gsxr1000, gsx-r1000!